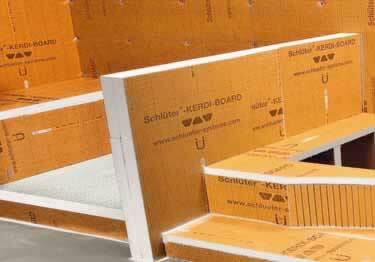 Schluter®-KERDI-SHOWER-SB Shower Benches make shower bench installation easy. These stable, load bearing, sloped prefabricated benches are quick and easy to install. They are lightweight, made from expanded polystyrene. Can be cut to size. Designed to integrate with Schluter Shower System. Recommend using in conjunction with KERDI waterproofing membrane. Schluter®-KERDI-SHOWER-SB Shower Benches make shower bench installation easy. These stable, load bearing, sloped prefabricated benches are quick and easy to install. They are lightweight, made from expanded polystyrene. Can be cut to size. Designed to integrate with Schluter Shower System.